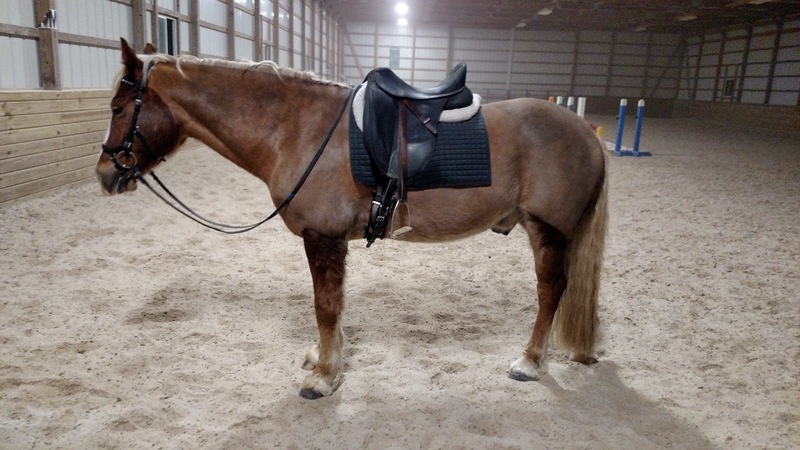 Cob Jockey: Dressage Saddle and NDPC: Game On! Dressage Saddle and NDPC: Game On! But I'd need a Dressage saddle for that, realistically. My husband has told me that if I can successfully show Third level, he will buy me a Dressage saddle, because, as he said, "If I'm going to pay that much for non-road legal transportation, I at least want some bragging rights to go along with it." He's a funny man, my husband. But Third is a long way off. Pretty much the only photo I have of the two of them. Photo by my mom. So as I was walking through the Houston airport, I replied to more Pony Cup Propaganda from Connor's breeder that if I managed to get a Dressage saddle this year and she could haul us, I would commit 100% to Pony Cup this year. To make a story that is much longer than I am giving it credit for short, I ended up coming home with a Wintec Isabel from Texas thanks to the incredible generosity of JenJ and her awesome (and me-sized!) friend FuzzyPony. FuzzyPony said the saddle was just sitting around and that she wanted to see it go to good use. 'Grateful' seriously doesn't even begin to cover it! JenJ also sent some pads that were too small for her guys, so we're all set. Thankful, so thankful. Yes, it has brown leathers for the forseeable future. You're all going to survive it, I promise. How do you get a saddle home on an airplane? You fly Southwest (bags fly free!) 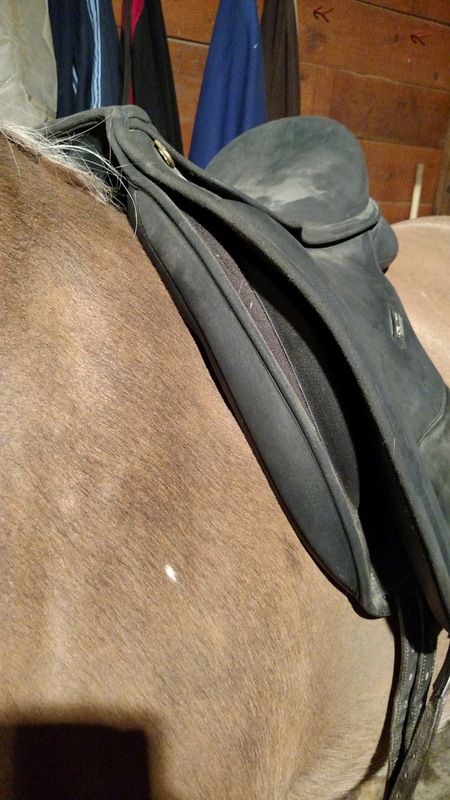 and check it and its saddle pads as luggage in a moving box, which, after being on two planes and four wet/snowy luggage trains, is pretty much disintegrated. But it made it! Saddle getting on Plane #2. 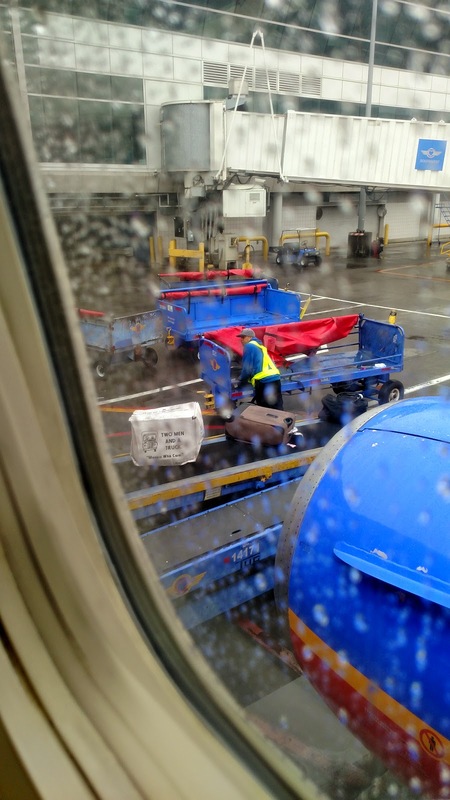 I saw the baggage handler give it a withered look as he fumbled it onto the conveyor. And a woman in the airport commented on my "interesting luggage". I said, "I unexpectedly came home with a saddle," and then she told me she rides cutting horses! How cool! Finally, the best news is that it fits both of us pretty darn well, and I had THE BEST ride in it when I got home. Dressage saddles make Dressaging so much easier, and I am the 1% of eventers who loves Dressage. Borrowed girth, brown leathers, don't care one bit. So happy! Also JenJ's square pad on this horse, yeah? I like it! Thank you, thank you, thank you! Now the story is: Pony Cup, game on! That is all pretty awesome! Have fun at the Pony Cup! Keep an eye out for online sales. I'm sure you can find a pair of black leathers between now and the Pony Cup. Even a $30 no-name pair will get you thru a few shows. That's what I am thinking. These will do for a little while, though. So exciting!!! The way things turned out, I think you guys are MEANT to go to the Pony Cup. It's fate! And how lucky that the saddle fits Connor! This is so meant to be & oh so awesome!!! Meeting Connor's sister sounds fab, and she (like him) is a beauty!!! Thank you! Dressage is awesome, I think 'progressive conversion' is definitely the way to put the process of learning to love it. Now you and Connor can get your DQ on! Looks fabulous on him! Oh yes, and in a 100% black and white color palette. We are rocking it. If you can use 48" leathers for dressage I may have a pair I can send you! I love dressage and can't wait to get my own dressage saddle again! I am not sure, but I think my new jump saddle leathers are 48" so I will try them on this saddle and let you know. I also have gone between having a Dressage saddle and not having one, and having one just makes things so much easier. Yay new saddle! My dad gave me black leathers (that I picked out) last week, or I'd still be rocking the brown ones too. Everything is so expensive. Lucky you! It really is expensive. That girth is borrowed too, and probably will be for a month or two. OMG! Want to share a tack stall at the Pony Cup??? Because that show is totally on my list this year!! 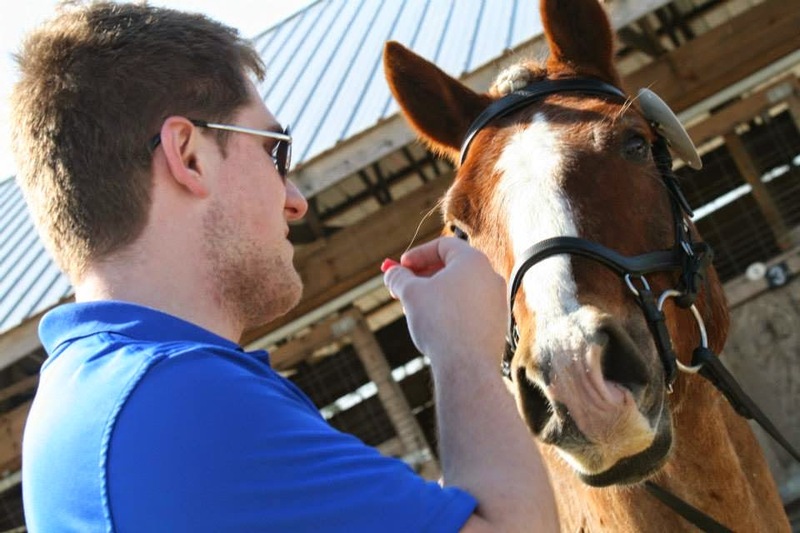 I don't think I need a tack stall, but I will totally request to be stabled next to you! It's the one show that I will be attending alone without my trainer and teammates so I would love the company! I LOVED my Wintec Isabell! They are great saddles! I thought I remembered you having one. I like the way it rides a lot. It's so nice to ride with a long leg and a deep seat again. How awesome! Good thing it is synthetic. Haha, yes, I have told him this. 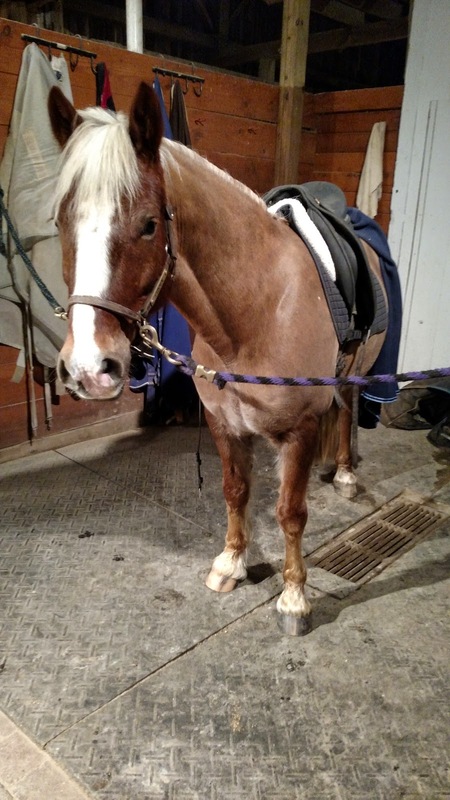 He said his offer stands and that I have to figure it my saddle situation out myself until my first Third level score. I figure by that time he can afford custom, right? I have several pony sized dressage girths and could send you one :) What size do you need? Oh! And if you're at the Dressage Pony Cup I'll be there to meet you since me and a friend will be going again this year! Awesome! Will you be riding? You can join the blogger stall party! I am not sure what size he needs, honestly. 18 or 20, probably. Unfortunately I won't be ridding, just spectating but I'll certainly find you and introduce myself. Umm.... this is amazing! Go Pony Power! I so wish we could hit that show, it would be so much fun. You guys will do amazing! I know, this has you written all over it. Move to Kentucky! Woohoo! So glad it fits. Now I need to send you black leathers and a black girth because MY EYES ARE BLEEDING. Sheesh. 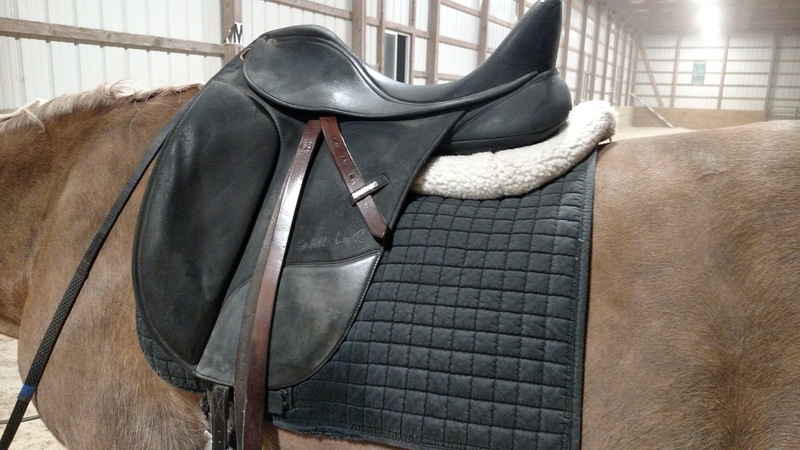 Those Wintecs are the most underrated saddles around! Glad it fits! I completely agree, after having ridden in this one. Never ridden in one before. I've been riding in brown leathers with my black dressage saddle for two years. Your leg hides everything. Plus you know I always support the ghetto fab in the horse world. Soooo excited to read about Pony Cup! Thank you, fellow ghetto fab supporter. We need a support group like the tack ho's have, only for ghetto fab. I am less ghetto fab than ever now that I own two complete bridles with respectively matching sets of reins for the first time ever. Feels weird, man. BUT THE BROWN LEATHERS! Jk, I give 0 fucks about brown leathers. I'm just glad you get to go to the pony cup and contend for AMAZING prizes! Plus Fuzzy Pony is pretty damn awesome. FuzzyPony IS awesome! I am not sure we'll score any prizes, but it would be sweet to get something! The brown leathers make me laugh. It kills some people, and others don't care at all. That just may happen. :) I tend to get around the country these days, weirdly enough. That is awesome!!!! I am in the 1% too and I love love love having a real dressage saddle! Yep! My trainer, who is heavily Dressage focused even, tells me I don't need one, but I want one. Haha! yay Pony Cup!!! that's so super exciting - and how very awesome and generous to have that saddle!!! It really is, and it sounds like there may be a few bloggers there as well! I'm crossing my fingers and planning on going to Pony Cup this year too - BEST SHOW EVER! Can I join the blogger stabling party?? We should totally set it up like that too! Woo hoo! Dressage saddle. I ride my section D in a Bates Isabel. She loves it, it rides well. My only issue is that I have super long thighs and there is no flap infront of my knee. The payoff is shoulder freedom for the pony. I also found mine rides better with a sheepskin lined pad rather than half pad on top of baby pad. Perhaps less bulk as 1 vs 2 layers of sheepskin. Have fun. Agreed on the shoulder freedom. Connor has always gone better in a straight flap Dressage saddles. No long thighs here, though, so that's not an issue for me! I've heard the Bates rides differently vs the Wintec. It looks like a really good fit on him. And yes, a good dressage saddle makes a huge difference! Best of luck with the NDPC! Oh that is so cool! I just fell in love with them, they're an amazing breed. Nice to meet you!